Great Britain has not been included in the talks about the teams to watch out for in the ongoing European championships, but they are currently silencing their critics. 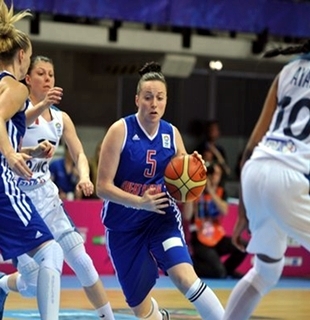 Great Britain, who has been showing continuous improvement throughout the years, advanced to the second round of the EuroBasket Women 2013 in France. The Brits opened up the tournament with a huge 76-68 victory over Serbia last Saturday in Trelaze, which was followed by an impressive 69-56 victory over Latvia on Sunday. Jo Leedham spearheaded the Brits in their first two games of the tournament, averaging 13 points and nine rebounds to go along with 3.5 assists. Azania Stewart also played a key role, posting an average of 11 points and 4.5 rebounds, while Kim Butler tallied 10 points and 6.5 rebounds per game. However, after posting two impressive victories, Great Britain failed to sustain their momentum as they absorbed a tough 79-47 loss against host France on Monday. They managed to stay within striking distance in the first three quarters of the match, but they just couldn’t stop France in the fourth period as they were outscored, 23-8, in the final 10 minutes of the match. Leedham was the lone double-digit scorer for Great Britain in that game with 13 points, but she shot just 4-for-11 from the field, including an 0-4 clip from beyond-the-arc. But despite losing against host France, Great Britain managed to finish second in Group C that gave them a spot in the second round and a good shot on advancing to the knockout phase of the tournament. Great Britain will play against Czech Republic, Belarus, and Croatia in the second round of the tournament. They need to finish within the top four of Group F to advance to the knockout phase.